Before we can use the dataset in RapidMiner we need to import it. In order to do this, we click on the Add Data button at the top of the Repository panel in RapidMiner. This will pop-out a new window where we will need to choose where the data that we want to import is located. In our case, the correct choice is “My Computer”. Next, we browse with the explorer to the location where our previously downloaded CSV file is located and we click “Next” after selecting it. The next step gives us some basic choices that we can customize regarding the import such as whether or not there is a header row, the start/end rows that we would like to import, file encoding etc. ; the default options are fine so leave all this as it is and go to the next step by clicking the “Next” button. 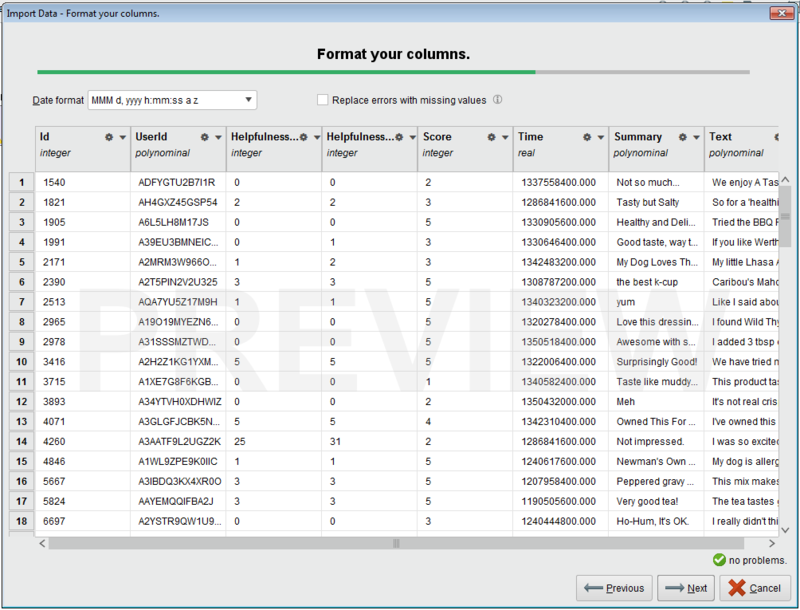 After we done the previous steps, it is now time to use MeaningCloud to do the sentiment analysis of the reviews. First things first – make sure that you have the MeaningCloud extension installed in your RapidMiner Studio and locate your license key by logging into your MeaningCloud account on our website. And that was the last part of the Transformation process! Now we just need to compare the results to see how well we did. In order to see how much the sentiment analysis correlate to the user-assigned score let us extract a correlation matrix. This can be done using the “Correlation Matrix” operator. In this step, we do not need to configure anything, we simply connect the output (exa port) of the “Parse Numbers” operator to the input port of the “Correlation Matrix” operator. Don’t want to go through all the process creation steps? 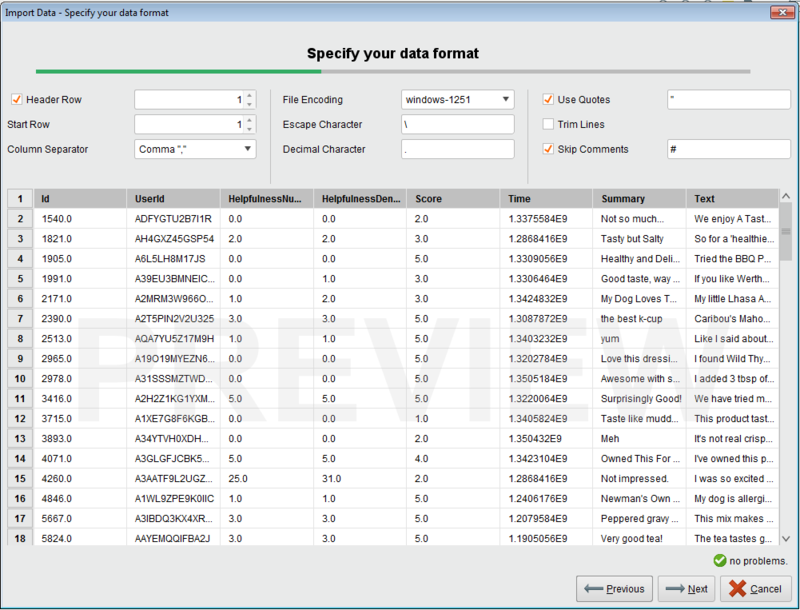 Just download the process specification Amazon fine food reviews dataset and import it into RapidMiner by using the File, Import Process option. We are now ready to execute the process and analyse the results! Simply click on the Play button on RapidMiner button bar. Try to be patient in this step, since the execution may take some time. As we can see, the correlation between score and polarity is 0.49 which means that almost half of the users have given the products that they have given a score which closely follows what they have written in the textual review of that same product. Congratulations! You have just finished your first process with the MeaningCloud Extension for RapidMiner and successfully predicted the sentiment for a set of food reviews. Be sure to visit the MeaningCloud website for more information about all the powerful (and fun) things that you can do with our APIs and for our next tutorial.